2012 Moto Guzzi 1200 Sport. Picture credits - Moto Guzzi. Submit more pictures. He superb handling is due to the exceptional rigidity of the twin cradle steel frame, the forks and the fully adjustable shock absorber these also guarantee both comfort and excellent road holding. Those of you that go touring will really appreciate the protection offered by the windscreen and how this sports bike so easily becomes a real Grand Tourer complete with heated hand grips, panniers, top box and satellite navigation system. Price as new (MSRP): US$ 9249. Prices depend on country, taxes, accessories, etc. Front suspension: Telescopic hydraulic fork with � 45 mm spring preload and rebound damping adjustable. 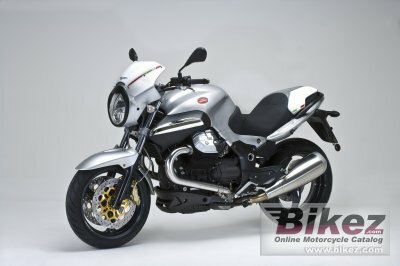 Ask questions Join the 12 Moto Guzzi 1200 Sport discussion group or the general Moto Guzzi discussion group. Click here to sell a used 2012 Moto Guzzi 1200 Sport or advertise any other MC for sale. You can list all available Moto Guzzi 1200 Sport bikes and also sign up for e-mail notification when such motorcycles are advertised in the future. Ads with or without pictures are easy to create. Our classifieds are completely free with sections for every country in the world. You can also check out our list of related motorbikes. Compare technical data. Look at photos. View your fellow riders' rating of the bike's reliability, design, engine performance, accident risk, repair cost, etc.